Distortion with detailed bass control. The Vulture has a great, throaty distortion with a nice bite to it but the low end and low midrange can be shaped in many ways, thanks to the low-boost and fat-boost knobs. This allows the player to dial in almost stupid amounts of lows, but the distortion stays tight, not muddy. T-Rex could have left it at a "bass" knob only, but the low-boost adds a lot of what we all love about 4x12 cabs. That is not necessarily what you need if you are looking for more "body" in the sound though. The fat-boost is designed to add weight and punch to the sound, giving the top strings a lot of depth and presence. The Vulture provides a great, throaty distortion with a nice bite to it but the low end and low midrange can be shaped in many ways, thanks to the low-boost and fat-boost knobs. This allows the player to dial in pronounced lows, but the distortion stays tight, not muddy. 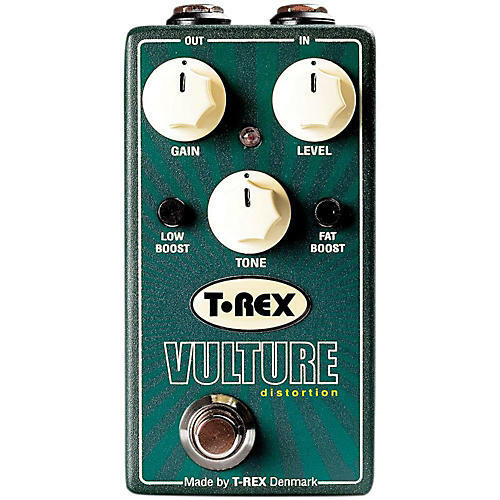 The secret to the Vulture is to adjust the boost and tone knobs for optimal sound when the gain is adjusted, just like on an amp. The Vulture is a carrion bird, one that feasts upon the fetid remains of the dead. Own the desert with tone, body, depth and presence at any volume. Order today and pick the bones clean. Dimensions: 2.4 x 2 x 4.5"